There are a variety of issues you could encounter while connecting to any online service, including Snowflake. Currently, this topic focuses only on the potential issues you may encounter with the OCSP (Online Certificate Status Protocol) checks performed by Snowflake clients. As an integral component of securing communications, each Snowflake client (Python, JDBC, ODBC, etc.) verifies the current validity of the signed Snowflake certificate issued by a trusted CA (certificate authority). If communication is blocked between a Snowflake client and the CA site or OCSP responder, a TLS/SSL error is generated. In Google Chrome, log into the Snowflake web interface. In the top-right corner of the browser window, click the icon (“Customize and control Google Chrome”). Then, click on More Tools » Developer Tools. The Developer Tools frame appears. In the frame, click on the Security tab. 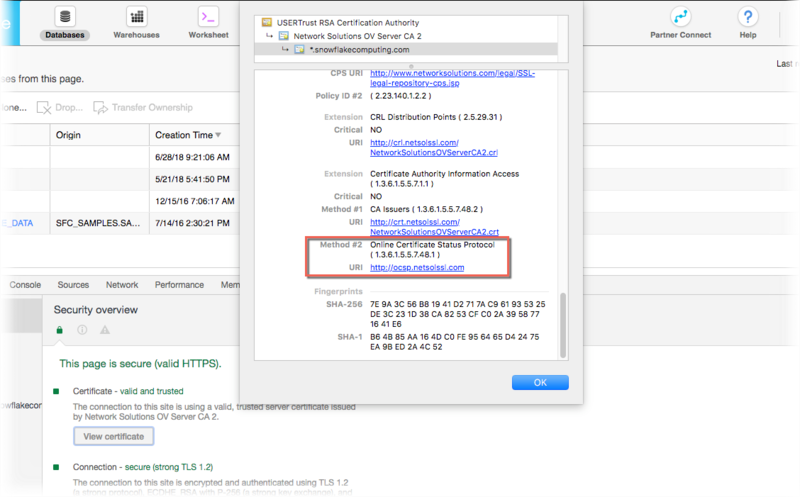 Click the View certificate button, then expand the Details section. Next, test your ability to access the URL (see Step 2). Various network issues could prevent the Snowflake client from accessing the URL. For example, your firewall may be blocking access to the sites used by Snowflake. Open a PowerShell window on the host where the connectivity problem persists. The Invoke-WebRequest command sends an HTTP request to a web page or web service and returns a response. Open a terminal on the host where the connectivity problem persists. If the command return an error, report the issue to your network administrator to diagnose further. They might need to explicitly whitelist the OCSP host used to check your certificate. If the command returns a status code other than 200, contact Snowflake Support. Snowflake uses the following hosts for OCSP certification checks. Note that the hosts may differ by Snowflake Region for a given cloud platform. For most accounts in US West (on AWS), Snowflake currently uses Digicert-signed certificates from Network Solutions. For other Snowflake Regions (on AWS), Snowflake mostly uses certificates from the Amazon CA. In addition, Snowflake may change certificates as they expire or require enhancement, which will result in different hosts and URLs. For a complete list of hosts and URLs for your account, please contact Snowflake Support. ocsp.snowflakecomputing.com:80 ✔ ✔ Snowflake’s OCSP response cache server. Note that the hostname is different if AWS PrivateLink is enabled. ocsp.snowflakecomputing.com:80 ✔ Snowflake’s OCSP response cache server. All communication with Snowflake happens using port 443. However, OSCP certification checks are transmitted over port 80. If your workstation is behind a firewall, make sure that the network administrator for your organization has opened the firewall to traffic on ports 443 and 80.